plant-derived essential oils (clove, cottonseed, garlic etc. )-Some formulations are OMRI-listed for organic use. abamectin (Agri-Mek, Epi-Mek) at 0.009 to 0.019 lb ai/a. PHI 7 days. REI 12 hr. Do not make more than two sequential applications or exceed 0.056 lb ai/a per season. bifenazate (Acramite 50WS) at 0.375 to 0.5 lb ai/a. PHI 3 days. REI 12 hr. Do not exceed one treatment. bifenthrin (Brigade 2EC) at 0.08 to 0.1 lb ai/a. PHI 3 days. REI 12 hr. Do not exceed 0.3 lb ai/a per season. Do not make more than two applications after bloom. Retreatment interval 7 days. acequinocyl (Kanemite 15SC) at 0.3 lb ai/a PHI 1 day. REI 12 hr. Retreatment interval 21 days. Limit 2 treatments. bifenthrin/avermectin (Athena) at 0.091 to 0.116 lb ai/a. PHI 7 days. REI 12 hr. Retreatment interval 7 days. Limit 2 treatments after bloom. Do not exceed 0.056 lb ai/a avermectin or 0.3 lb ai/a bifenthrin per year. borate complex (Prev-Am Ultra) apply at 0.4% solution. Spray to complete coverage. REI 12 hr. OMRI-listed for organic use. etoxazole (Zeal) at 0.09 to 0.135 lb ai/a. PHI 7 days. REI 12 hr. Limit 1 treatment per season. fenpyroximate (Fujimite) at 1.25 lb ai/a. PHI 3 days. REI 12 hr. Limit 2 treatments per crop. Do not exceed 2.5 lb ai/a per season. 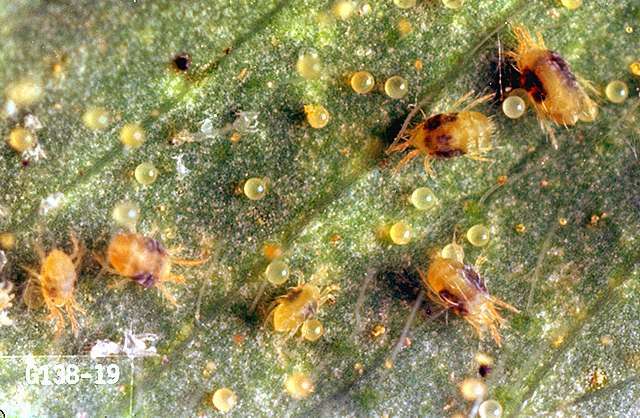 Isaria fumosorosea (PFR-97 20% WDG) Most effective when application is initiated just before or at the first signs that target pests are present. OMRI-listed for organic use. lambda-cyhalothrin (Warrior II) at 0.03 lb ai/a (suppression only). PHI 1 day. REI 24 hr. Do not exceed 0.18 lb ai/a per season. malathion (Fyfanon 8) 1 lb ai/a. PHI 1 day. REI 12 hr. Limit 4 treatments for watermelon and 2 treatments for all others. Retreatment interval 7 days. spiromesifen (Oberon 2SC) at 0.11 to 0.13 lb ai/a. PHI 7 days. REI 12 hr. Do not exceed 0.4 lb ai/a per season. Retreatment interval 7 days.